LinkedIn Skill Endorsements are an unreliable measure of the quality of the endorsed executive. Still, I must confess that whenever I receive a LinkedIn Skill Endorsement, I get a little thrill that someone has recognized my expertise. But when I click to review the LinkedIn profile of the endorser, I am puzzled. Clearly, the person is in my network as a 1st-degree connection, so I likely met that person at a conference or other event. However, I wonder how he or she could possibly vouch for my work when I haven’t ever worked with them. Perhaps they heard good things from mutual colleagues who have worked with me. Perhaps I’m famous out there. As much as I would like to believe that, I suspect it is not the case. Maybe the reason near strangers endorse my skills is to set up an implied quid pro quo. As in, I’ll endorse your skills if you endorse mine. But I also don’t think that is what is happening here. I suspect they simply want to engage my interest for networking or recruiting purposes. In other words, the vast majority of my LinkedIn Skill Endorsements have been given by LinkedIn members who have never seen my work or any of the skills they have chosen to endorse. Of course, I could be an outlier. So please let me know what you have observed. Here is the way LinkedIn Skill Endorsements are supposed to work. First, a LinkedIn user lists up to 50 skills on their profile. Next, a 1st-degree connection of that user endorses one of that persn’s skills. 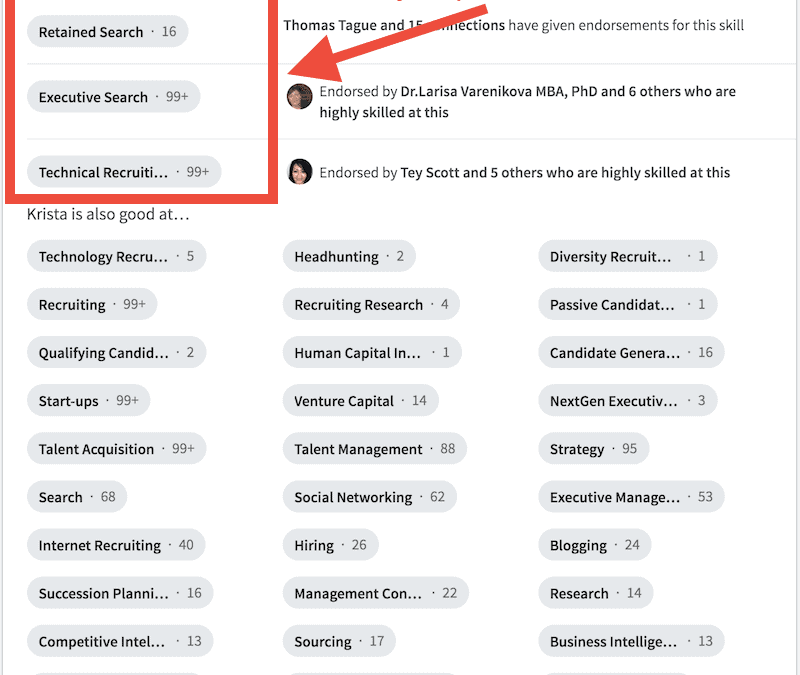 When that happens, LinkedIn contends the skill is “validated,” which reinforces their “weighting” of what skill endorsements rise to the top of the user’s list of skills. LinkedIn treats Skill Endorsements as validations of abilities. From where I sit, it is a false premise since most of the endorsements come from people who know little, if anything, about the quality of my work. Those relatively bogus endorsements are then used algorithmically to tell LinkedIn members which of my skills are the strongest. From what I’m able to gather, skills with the most endorsements rise to the top. 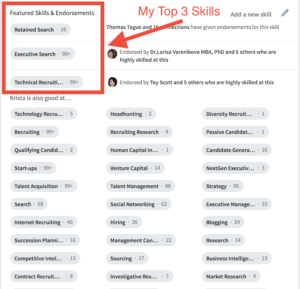 LinkedIn explains the purpose of Skill Endorsements is to help “recognize and discover your 1st-degree connections’ skills with one click. They’re also a simple and effective way of building your professional brand and engaging your network.” True, they are simple. But because they are, for the most part, untrue, are they effective? Do you really want to begin a relationship by demonstrating you are comfortable being dishonest? Skill endorsers are not the problem . . . Though often my LinkedIn skill endorser is technically fudging the facts, I do not blame the messenger. I see the bogus endorsement more as a shout-out from the virtual wilderness as in, “Is anybody out there?” I feel a sense of gratitude that there are people out there who want to give me “put ups” rather than put me down. So I am not complaining about those who have endorsed my skills. Rather, I am questioning the frame of LinkedIn’s skill endorsements themselves.
. . . LinkedIn endorsements are. Qualitatively, LinkedIn Skill Endorsements would not hold up under the least bit of scrutiny. They are not a reliable indicator or measure of excellence. They are more a nicety designed to help us make friends on LinkedIn. I get that. Besides, what would we do instead? A “Can we please be friends?” button would come off as a little too needy. A “Let’s network” button might do the trick, but it demands a reply. I guess that’s the beauty of Skill Endorsements. You have LinkedIn members out there spreading goodwill as an entré to forging a real relationship. Let me do you a favor by saying you’re really great at something though I don’t really know you and haven’t a clue whether you’re really great at that something. So if you want to befriend me on LinkedIn, you can endorse me as a kind of shorthand that you are a good person who does good things. However, I find it far more interesting to cut the B.S. and have heart-to-hearts with people I trust who share similar passions and interests. At the end of the day, what we really want in this world, even at work, is a safe place to be our authentic selves. So what’s a LinkedIn member to do if Skill Endorsements are not the best way to network? 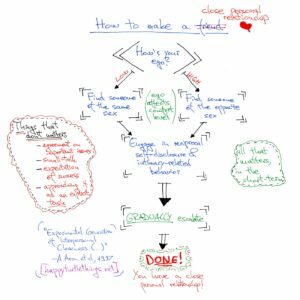 I’ve written about how to polish your LinkedIn profile to optimize networking on LinkedIn. That is essential. Without a polished profile, everything else you do on LinkedIn will fall short. That’s because the moment you say or do something interesting, members will check out your profile. So, while you can spend time endorsing the skills of virtual strangers, I’d recommend taking a more direct route. Focus on a handful of people you’d like to get to know. Do them a solid. Share a meaningful insight. Find a way to break through this virtual medium to get real. It isn’t easy, but it will yield greater results. I often follow people I want to get to know here and on Twitter. I read their blogs to get to know them, and then I formulate an approach. Commenting on someone’s blog often is a great way to open the door, if what you say is halfway intelligent. People write with the intent of being read. Your comment fulfills that basic human desire and forges an instant bond over a shared interest. For that method to work, you have to be real. That is something of an art in a virtual environment where truthiness in LinkedIn Skill Endorsements is an accepted practice.